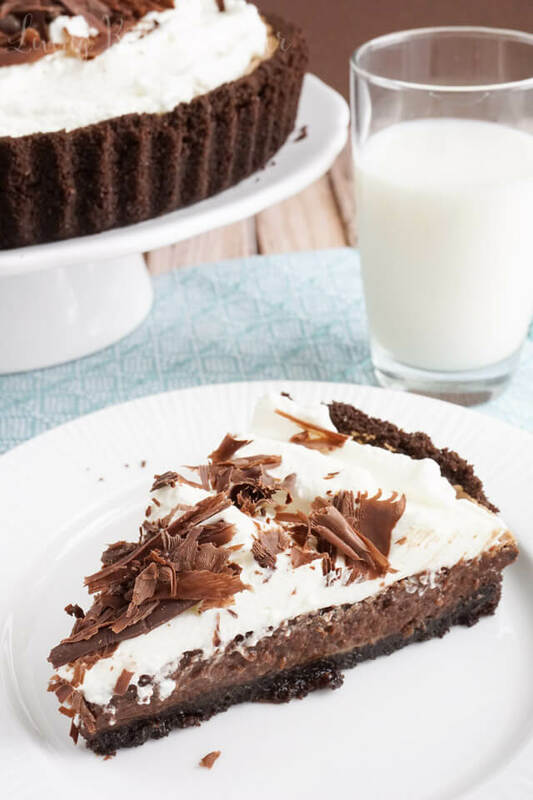 This Mississippi Mud Pie is a perfectly rich blend of chocolate and cream in a crisp chocolate graham cracker crust – lord have mercy on our waistlines. You guys! YOU GUYS! THIS PIE! 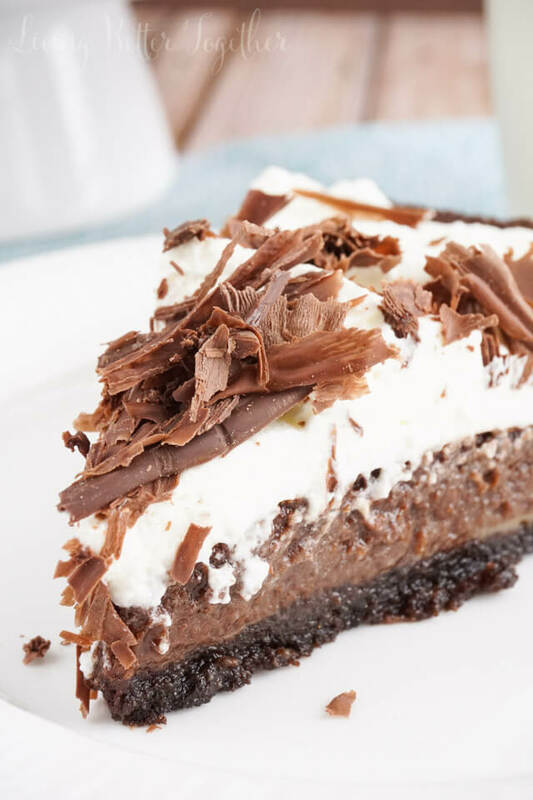 This rich, unbelievable, chocolaty, creamy, heavenly Mississippi Mud Pie – It’s simply amazing! I honestly don’t think it gets any better than this. I’m just going to stop all future baking right now because this pie is the only thing I’ll ever need. It’s giving Banoffee Pie a run for its money as my favorite dessert of all time! It’s THAT good! We went to Mississippi back in 2010 for my husband’s best friend’s wedding. We were only there for a couple of days. It was July in Vicksburg and it was HOT! The wedding was at the lovely Cedar Grove Mansion Inn, right on the Mississippi River. I loved learning about some of the Civil War histories of the area while we were there. The Mississippi was not what I expected, it was so dirty and muddy. So I guess there’s some validity to the Mississippi Mud Pie’s name; given due to its thick chocolaty filling looking like the muddy banks of the river. No matter what it looks like though, it tastes freaking AH-mazing! They sure did this dessert right – oh, and their fried pickles are pretty damn good too! Buy My Favorite Pie Server Now! So what exactly is Mississippi Mud Pie? Oh, you want more than that? 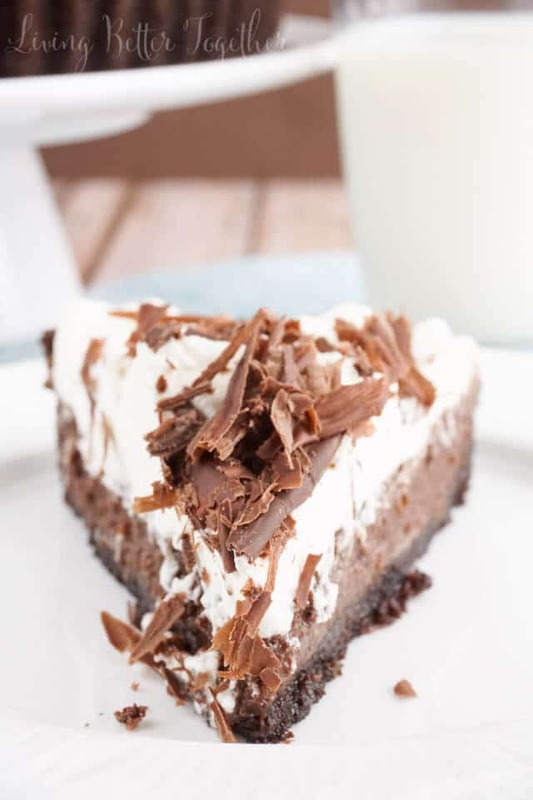 Mississippi Mud Pie is made up of a crumbly graham cracker crust, a thick and rich chocolate filling that’s almost like brownie batter (drooling yet?) and topped with a simple whipped cream and big chocolate curls. 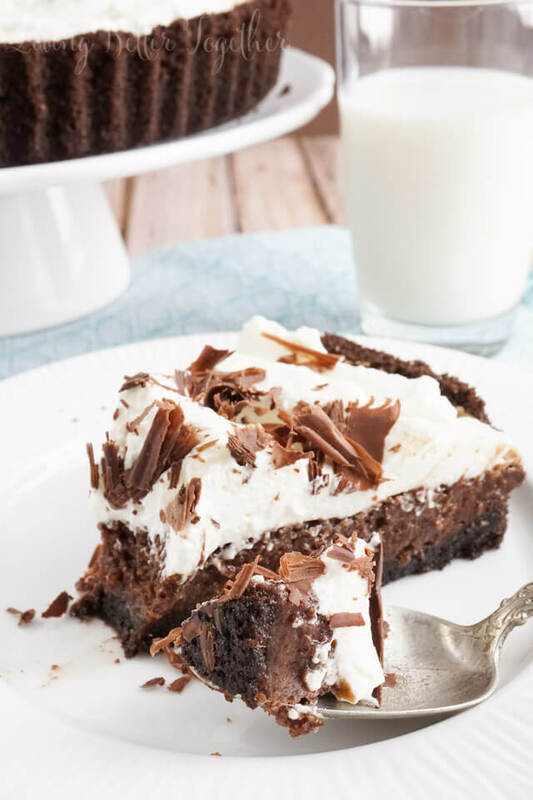 Ready to join me on the Mississippi Mud Pie bandwagon? If yes – wise choice! If no, fine – more for me! Buy A Springform Pan Now! Important Notes About this Mississippi Mud Pie Recipe! This recipe was retested in January 2018. I no longer recommend using a standard pie dish or tart pan for this recipe – Springform Pan Only! After a lot of retesting, I have increased the crust ingredients to allow for enough to make a deep dish pie. Because this is a graham cracker crust, each one may have a different thickness or height depending on how each individual person presses the crust into the pan. The batter should only come within 1/2 inch of the lip of the crust. If you have excess batter after that, discard it. PLEASE MAKE SURE YOU REDUCE THE HEAT AFTER REMOVING CRUST FROM OVEN! The filling will rise up a little but will resettle during the cooling process. 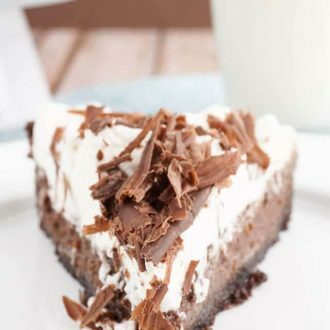 This Mississippi Mud Pie is a perfectly rich blend of chocolate and cream - lord have mercy on our waistlines. Transfer to a bowl and make a well in the crumbs, pour the melted butter into the well and mix to combine. Add the sugar and stir until combined. Press crust mix into the bottom and sides of a 9-inch springform pan.Make sure the sides cup up high to reduce the risk of overflow. Remove from oven and REDUCE HEAT TO 325 F.
While crust is baking, cream together butter and brown sugar in a stand mixer with a paddle attachment on medium speed. Beat in eggs one at a time, mixing in between on low, scraping down the sides as needed. Melt chocolate chips in a microwave-safe bowl on 30-second intervals, stirring between each until fully melted. Mix in melted chocolate, cocoa, heavy cream, and chocolate extract on low speed until fully incorporated. The mixture will be liquid. Carefully pour mixture into the prepared pie crust, since crust may vary slightly in thickness and depth of the shell, do not overfill. Pour until the batter is 1/2-inch from the lip of the crust and then discard the rest if there is excess. 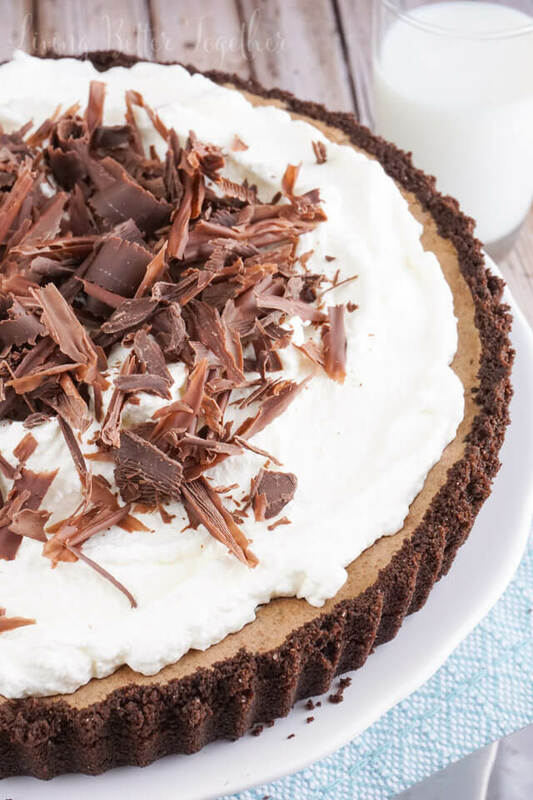 Remove from oven and allow to cool to room temperature, then either top with the Homemade Whipped Cream recipe and chocolate curls and serve or transfer to the fridge until ready to enjoy. I recommend topping with whipped cream right before serving, but it can be done in advance if crunched for time. Leave pan sides intact until ready to serve. In my experience, the mixture hardly rises, but some readers have reported that it does rise for them, therefore, this recipe has been updated to bake only in a springform pan to better prevent overflow should the filling rise. If you do not have a springform pan and wish to make the recipe in a pie or tart pan, place it on a lipped cookie sheet to reduce the risk of overflow. 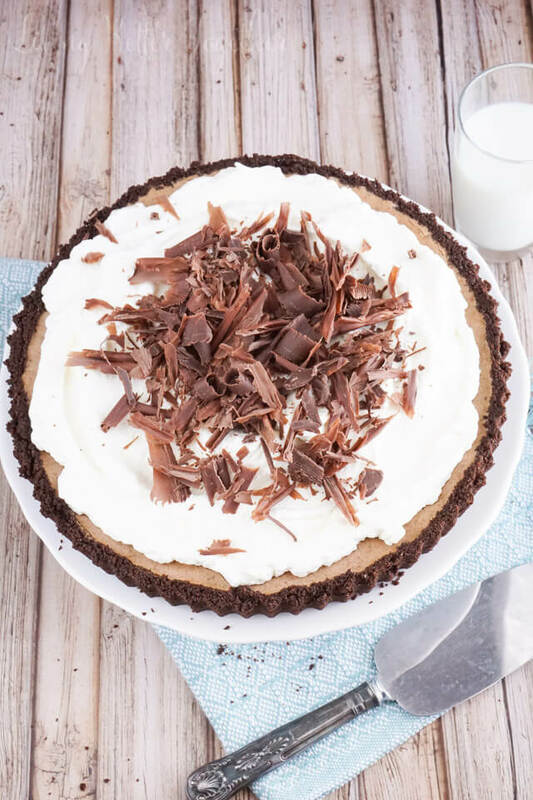 You can also use a pre-made chocolate graham cracker or oreo crust. Recipe Adapted from Food Love Cookbook. Just gorgeous. You had me at chocolate. YUM! Be still my beating heart. I am in love with that pie Rebecca. That is one heckuva pie! I’d glad eat a slice or seven… and I love the crust. I am such a fan of how easy graham cracker crusts are, and you made a chocolate one! Brilliant! Pinned! That is one heckuva pie! Can you tell me how much the graham crackers yield after they have been crumbled? 1 cup – 2 cups? 7-8 crackers usually yields a cup, so though I didn’t measure this recipe out myself, my guess is around 1 1/2 cups. Hey, I just made your pie and its right now in the oven. I took a peek at it sometime close to the 45th minute and it looks very liquid, I’m a bit worried now to take it out at 45minutes. umm, some advice please? Sorry I didn’t respond sooner, I’m just getting up where I am. Yes, the center of the pie will still be soft, the setting and cooling in the fridge will help solidify it. You should have a nice light brown crust on the top when it’s done though. I was just wondering the same thing LOL. Thanks for asking! So excited to make this pie! It looks Gregory’s. Quick question: Once I top with the whipped cream, do you think it would be okay to leave the pie in the fridge for 12 hours or so before serving? Will the whipped cream last that long? Hahaha…Gregory’s= gorgeous! (Darn autocorrect) ? Whipped cream should last a few days in the fridge and if I remember right from the last time I made this, it holds over fairly well. I’m making this for a special group of graduate students coming to my house on Wed. It looks so delicious and I’m sure they will enjoy it! Oh, I hope you do, it’s one of my all time favorite desserts! What did you use instead of graham crackers for the crust and what size dish did you make it in? Like Shar from July 25, 2016, I had more than one pie’s worth of filling. My pie pan is 9″ and about 1-1/2″ deep. Pretty standard, I think. I only put about 2/3 of the filling in the pie, and the Mississippi overflowed its banks all over my oven. It was a mess. The pie wasn’t pretty but still tasted soooo good! Would high altitude make a difference? I’m at 6,220 feet. PS At the recommendation of a friend, I added about 1/3 cup of chopped almonds to the crust. Yummy! Just a thought, did you make sure to REDUCE the heat after baking the crust? I will make a note in the recipe until I can try to figure out what the issue is. I am glad you enjoyed the flavor though! Did you have any issues with the filling rising up over the crust? Where’s the marshmallows? And the melted chocolate? This isn’t near a true Mississippi Mud Pie. Incredible!!! I won a pie contest at work with this, and I am planning on making it again for the next gathering with relatives. Delicious!!!! Woohoo! It’s definitely a winning recipe!